Another blogging buddy, who is also an author, is stopping by today to chat about her debut novel, The Knife with the Ivory Handle. I reviewed this novel last week and she was kind enough to agree to an interview. Please welcome Cynthia Bruchman. How would you describe your first novel, The Knife with the Ivory Handle? Historical fiction, thriller, psychological, all of the above? It was difficult classifying it. I think it’s a blend of the historical climate mixing plot driven and character driven story. I certainly wanted the reader to go inside of the character’s heads and see how they viewed their world. Why do people behave and react as they do? How does our past shape our present attitudes? I tried to create four distinct personalities. When did you first get the idea to write this story? I was working on my Master’s in history at Illinois State University. The research involving ethnic regionalism in North Central Illinois was fascinating. I saw these stories emerge from the immigrants who arrived to the area to mine and eke out an existence for themselves and family. I saw how religion played a huge role deciding how one labored and lived. Then I went to Goddard College and decided to write a novel around the research. The novel was my MFA in Creating Writing manuscript. It took me three years to write the novel. On your blog you write about your love of movies and certain actors. Do you think your love of film has helped you as a writer? Yes, most definitely. I see films as visual texts which are fun to analyze. I like to talk about films with others—the community experience in blogging is strong with movie buffs. That’s why I write about them so much, because I like the interaction between people. I am always flattered and enjoy “talking” with other people around the world. It’s like the fans of sports who can sit around discussing their team and players all day and be passionate about it. Everyone loves movies. Actors are manifested characters. Directors and screenwriters and composers all get a say in the whole package. You have traveled extensively. Do you think your traveling experiences helped mold your writing? Yes, because I can pull out people and settings from my mental file cabinet and reshape them into something original on paper. It’s like taking a memory or detail and putting a drop of water on it and watching the character or setting sprout and watching it grow—who knows how they will turn out? Nothing is more fun than listening to my characters and letting them have a say in the story. You have lived in many places. Which has been your favorite? My favorite place was Scotland. I was in the Navy and requested anywhere in the UK because I was already an Anglophile in high school loving British literature and history and films. I saved my money and visited London and the countryside when I was seventeen and caught the travel bug. Then later when I became a teacher, I started escorting students to foreign locales. My favorite destination for a vacation was Greece—the Cyclades Islands. Santorini and Mykonos–OMG how breathtaking. Louise Erdrich, John Steinbeck, Richard Hughes, Ursula Hegi, and Wm. Shakespeare. Cindy teaches AP US/World History, Holocaust Studies as well as community college Humanities courses. Her home state is Illinois, but she has traveled and lived all over the place. Cindy is a Navy Veteran and was fortunate enough to have been stationed in Scotland for four years in the 80s. Fast forward–she started college late at age 30 and now has a few expensive pieces of paper to show for herself. 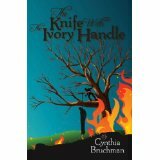 This entry was posted in Author Interviews and tagged Author Interviews, Book Review, Cynthia Bruchman, Historical Fiction, Indie Authors, Indie Writers, Kindle, Self-Publishing, The Knife with the Ivory Handle. Bookmark the permalink.